by Choo ThomasDo you believe heaven really exists? Choo Thomas tells a remarkable story of her encounters with Jesus Christ, where she visited heaven many times and saw hell twice. Her book, "Heaven is so Real" is more than just a book - it is Christ's loving message to a generation that has largely forgotten, misunderstood or is indifferent about Him. This book will touch your heart and soul and will challenge you to live a life of obedience and purity like you have never done before. "On January 19, 1996, I woke up at 3:00 in the morning. My body was shaking...I turned my head on the pillow to look in the direction of the sound, and there, all aglow, was a figure dressed in white garments. IT WAS THE LORD..."
Below is a 40 minute video documentary about her experience. This Video and Audio documentary is NOT the actual book! An Asian reader gave me this link for Choo's E-Book Version, from a foreign website, it also contains an MP3 of each chapter. I haven't been able to successfully contact the website's manager. But, I haven't been able to successfully contact the website's manager. In 1992, a Korean American by the name of Choo Thomas, becomes a born again Christian. What makes this story unique is that two years after her conversion, Choo was visited by Jesus Christ of Nazareth. She was subsequently escorted to heaven several times and shown hell twice. Choo Thomas has written a book about her experiences; the book is called “Heaven is so Real” and it was published on October 2003. Within a year of being published, this book has become an international bestseller as well as a top ten Christian Charismatic book in the United States. How does a simple housewife, who speaks limited English, not only manage to publish a book, but within a year of being published, it becomes an international bestseller ? But perhaps an even more important question is why these revelations now. “Heaven is so Real” and this is the story of Choo Thomas. “The Lord and I walked along the road that came down from the top of the hill. Eventually we reached a huge white gate that stood in front of a large white building. We walked through the gate and proceeded towards the white building. We entered and walked down a long corridor that led to a very large room. Which we entered . As I looked down, I realized for the first time that I was wearing a different robe than I had on at the beach, and I could feel something heavy was resting on my head. I reached up and discovered a beautiful crown had been placed there without my realizing it. Then I looked directly at the Lord. He was sitting on a throne, and He wore a radiant gown and golden crown. Others were there with me, kneeling on the floor and prostrating themselves before Him. The walls of the room were made of large shiny stones that glowed. The multicolored rocks provided an effect that made the room seem warm and happy, as well as mysterious. Then, just as quickly as I had been transported up the mountain and into the white building, I found myself on the beach again. Very first time He only showed me His throne room. Then after that we came down from heaven and the, we were sitting on the sand on earthly beach. And then He began to talk. He said, "We just went to Kingdom of Heaven. The only one who will come there are obedient and pure hearted", and He said "Preaching gospel is very important" and He waited for awhile, and He said "those who don’t tithe, they are disobedient Christians." That was the last word He said the first trip. “In my transformed body, I walked with the Lord on the beach, and then He escorted me to heaven. We walked through the pearly gates and went to the white building to change our clothing. After changing, we walked across the golden bridge. It all was becoming so natural to me. Each believer, I’m sure, will go through the same procedure when he or she goes to heaven. After that, He took me to heaven 16 more times. Each time He took me there, He showed me different things. And when He showed me special things, always, he was saying that I prepared this for my children, I know what they like. Like when He showed me beach, you see daughter how beautiful this beach is, I know my children like this beach and when He took me to fishing, I know my children like fishing, that’s why I prepare so many things what they like and I realized in heaven is well a thousand times beautiful than on Earth, but a lot of things like on Earth like roads, buildings, trees, bushes, rocks, flowers, rough places outside the kingdom; there are so many things there; but that they are thousand times beautiful on Earthly things, just beautiful. The beauty of heaven is indescribable and I can’t even describe how beautiful they are, just beautiful. And the, I realize how much Jesus loves each and every one of us. The way He talked to me was saying that “you see how much I love my children and I did all these things for my children”, you know. That is why He took me there to show what He prepared for His children, so let each and everyone know what heaven is waiting for us, so before He comes, He want all the Christians to know this things, so they can be excited and go there. That is why I believe He showed me these things. He doesn’t tell me everything, you know, thoroughly, He just show me some certain things, just say very few words, necessary words He tells me. That’s loving God He is. Praise you Lord. Besides experiencing heaven, Choo was also show hell twice. She described hell vision as follows: I could see fumes and dark smoke rising from a deep pit. It was like the crater of a volcano, and inside I could see flames scorching a multitude of people who were screaming and crying in the kind of agony that only the severely burned truly know. The people were naked, without hair, and standing close to one another, moving like worms, and the flames were scorching their bodies. There was no escape for those who were captured in the pit-its walls were too deep for them to climb, and hot coals of fire were all around the edges. In heaven whatever he showed me was such an exciting thing and awesome things but next, He showed me Hell. He took me to hell, the first thing I seen inside was all fire, but it was deep, dark, endless hole. People were naked, with no hair. They didn’t have no hair, they didn’t have no clothes on, all naked body. They were standing so close to each other. Seems like they are, they were pushing each other against because they want to get away from the fire. Each time they move, the fire follow them, back and forth, back and forth, just whole place was fire, and these people were standing so close to each other. They looked so pain and sad and I couldn’t help crying so much for them. Then he took there a second time and I saw same people again. Then I heard voices and I looked a the directions, so many Orientals there. And this one lady, she was waving at me, saying so hot, so hot. I looked at her and our eyes meet each other. That my mother. When I realized it was my mother, my heart dropped and I began to cry. I have never felt such a pain, just pain. So pain, I didn’t know what to do. And she kept saying hot, hot and she was waving at me. And the way I seen it, she wanted me to come down and help her. Then I looked, other people, there was my dad, my stepmother, my young nephew, he died very young and two friends that I knew. Oh, that was such a painful memory and I keep crying crying crying, then the Lord Jesus told me “daughter, I have a good reason to show you this, but I am hurting more than you are”. Uumm. And I told Him, Lord, my mother, she died young, she has been sick for a very long time. I don’t think she was a bad person. He said, "It does not matter how good people are, whoever doesn't know me, this is the only place they go." But in my heart saying, why are you showing me this to hurt me this way. I thought about that, but I could never angry at Him. I couldn’t see His face, but I could tell He was crying with me. I just feel that. He looked so sad, then He touch my head, took my hand, we walked out there and I was crying the whole time we were walking. In the book, I explained the very details, so, then, next visiting he showed me another sad thing. It was aborted babies. He took me to this one place it was a huge building. They looked like warehouse. When we walked in it, all I see was babies, tiny, tiny naked babies. And they were lying side by side. Humm, and I began to cry. Lord, why is so many babies. He said, "they are the aborted babies". I said what are you going to do with them. He said that if their mothers are saved and they come to heaven, they will have their baby back. That was it. “His words stirred me deeply. My heart actually ached with love for my Lord. He stood up, and I knew it was time for us to leave. I continued to cry, but my heart was reassured with the knowledge I would be with the Lord forever and that He would always be with me on earth. At the dressing room, an angel of the Lord embraced me. It was so exhilarating to be in a place where so much love, compassion and understanding were always present. As I changed my clothing, I surmised that both Abraham and the angel knew this would be my last visit to heaven. As I walked out of the changing room, the angel hugged me once more. This angel had blond hair, flowing white robes and a face that was tender and warm. The angel smiled at me as I walked towards the Lord. When the Lord Jesus took me to heaven 17th time, He showed me clouds. And that was the end of my visitation in Heaven. The Lord Jesus told me this is the last time you are here. I will not bring you here until the last day. I just felt I knew this, that was the last day. And I began to cry, because I didn’t want to leave there. I was holding His arm and I said Lord, please don’t let me go, I don’t want to go because I want to come here over and over. It was very very sad for me, that I couldn’t go there anymore, because each time I went with Him in heaven, I saw sad things, but joy peace, I can never explain, never can explain the joy, peace I had there. Even sad, I still had the joy, the peace. So much love, I cried many days for that. The Bible talks about a day when Jesus Christ will come again for His church. In 1 Thessalonians 4: 16, it reads “For the Lord himself will come down from heaven, with a loud command, with the voice of the archangel and with the trumpet call of God, and the dead in Christ will rise first. After that, we who are still alive and are left will be caught up together with them in the clouds to meet the Lord in the air. And so we will be with the Lord forever” This is know as the rapture. After all that, about a couple of weeks later, Lord Jesus, He brought me to the beach with my spirit body and His. And we sit usual place, then we talked for awhile and the, He told me, I will show you something. The minute He say that, I had a vision voice. Every time He shows me something special, I get a special vision voice that is coming my inner body, stomach. It was so loud and this vision voice took very long time. Then I could hear noises, such such a loud loud noises, I felt the whole world was coming down, so loud, just horrible noises. Then I look, whole air was white. People with white robe flying everywhere, just keep popping out, popping out, just disappear, popping out, filled with air, with people. Then I know that was rapturing. I was laughing, crying, screaming, so excited, and then I saw my granddaughter, she only ten months old, she didn’t have no hair, suddenly she fly out the window from inside the room. Then with white rob and her hair came down to her shoulder. You can imagine how excited I was. Then next minute, I saw my other granddaughter, she was only 4 months old, she didn’t have no hair. She flew out the window, same as the other one, with white robe. And her hair too came down to her shoulder. I was screaming, crying, laughing, exciting so much just I never excited that much before, just excited, whole house could hear. Good thing my husband wasn’t home. If he was home, he really thought something was wrong with me. And after that, God showed me different scene. This scene was very sad one. It was horrible. The Bible also talks about a time of great distress, soon after the rapture. In Matthew 24:21-22, Jesus said “For then there will be great distress, unequaled from the beginning of the world until now -and never to be equaled again. If those days had not been cut short, no one would survive, but for the sake of the elect, those days will be shortened.” This is known as the great tribulation. 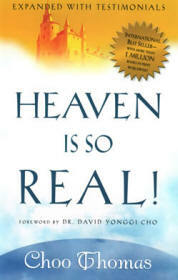 The book, Heaven is so Real, is currently being translated in many languages and being distributed all over the world. There is also an MP3 version of this book, which can be purchased online. Well, book is doing great. And this book is an international bestseller. The Lord used Dr. Yonggi Cho for this book and he translated this book. It took him about two months to translate, usually takes about six, seven months. So, the day the book was printed, and it exploded in Korea and is number one bestseller there. And almighty God using Dr. Youggi Cho such awesome way. He has almost 800, 000 members in his church, so God is using him for this book, he chose him for this book. Praise you Lord, and the book is our Lord Jesus’ end-time book. He wants all the Christians to read this book and witness to others and this is what lots of people are doing, when they buy one book, they buy dozens, they buy hundreds, and they say this is best witnessing tool besides the Bible. And then, I receive so may emails, I don’t have anytime for my own anymore. And especially when I receive email from little young children about 12, 13 years old. They are saying they are so much in love with this book. They love Jesus, they call this Jesus’ book and they are transformed by book. Some of them saying, I should quite school and do God’s work. I say don’t ever quite school. You have to study, God wants you to have education. That’s what I tell them you know. But whatever you do, put God first I say. When I answer their emails, they are so happy, You know, thousands and thousands of lives are changing with this book because it is Jesus’ book. and he fulfilled all His promises for this book from beginning to end. He told me, well, He’ll take care of everything, from beginning to end I told Him well, I was very worried, many things, you know, then He told me, why you worry, this is my book, I will take care of it; always He tell me that. But He has been taking care of everything from beginning to end. Whoever read this book, they know this is Jesus’ book and He did take care of everything. So, all His promise for this book, He fulfilled. Now, only thing left is my dancing ministry. He trained my dancing ministry; this is holy dance, for three years, then, I dance at the church for two years. Now almost 3 and a half years, I’m waiting on Him. Waiting is the hardest for serving God. You know, I had to wait seven years before He publish the book. Some time I thought if He will ever publish this book, but He fulfilled His words, you see. At the end of her Heavenly trips, Jesus makes a very special promise to Choo. The reason why Jesus died on the cross is because of John 3:16 - For God so loved the world that he gave his one and only Son that whoever believes in him will not parish, but have eternal life. Therefore, according to Romans 10:9 - If you confess with your mouth, “Jesus is Lord”, and believe in your heart that God raised Him from the dead, you will be saved. Well, I hear so many people say “who cares after you die”, hee hee hee. Then I say, "you better care after you die. This was when I was witnessing. If you die, you only go two places, either heaven or hell." They say, "eeeehhh, who cares after I die." They talk like they don’t know anything after they die. I say, "you better care after you die, because why ? Even you die, your body die, your spirit, soul will never die. That’s why you can remember, pain, happy, joy, everything just like when you were alive." But they still don’t believe it. Aaaaah they get angry at me. I say, "I hope someday you will remember what I’m saying. Do you know Jesus?" They say, "I know God." I say,"well, Jesus is God. He’s the Father, He’s the Holy Spirit, He’s all. If you don’t know Jesus, you saying that you know God, that’s not going to take you to heaven." I just talk and talk but they don’t want to hear, most of these people. So I just tell them, "well, you don’t want to believe it now, I hope someday, you will believe." And I talk and talk but no matter what, they don’t want to accept the salvation package. You know what I say, I say, "OK you don’t want to accept this salvation package is fine, but one day, you will know all of God’s people will be raptured, then you will know what I’m saying right now, but I ask you, that time comes, never to receive the number 666. If you receive that, you going to burn in hell for ever, ever, ever. So please, please, please, don’t ever receive the number 666. Will you please remember?" You know, some of them say OK. I say this to many many people. On behalf of Choo Thomas’ Ministry, thank you for watching our show. In “Heaven is so Real”, Jesus said that He’s coming back for His Church sooner than we think, so get ready and lets give our God all the praise.